Jacob SPITTLER, Sr., born in Haslach, Baden Germany in 1793 married Catherine RENKERT (1795-?) in 1815 and had 6 children - Jacob, Jr., John, Catherine (1816-?) who married Martin KNOLL, Anna Mary (1828-1868) who married Michael CARPP (1830-1896) and moved to Michigan, Salome (1821-1894) who married Andreas RISSER and moved to Wisconsin and Maria Barbara (1824-?) who married Jacob RENKERT. While still in Germany, Jacob Jr. (1813-1902) married Mary Anne VETTER (1808-1902) and had 3 children - Mary Anne (1840-1900) who married Peter MOHR (1835-1868) and had children Peter, Emma, Louisa and George; George (1841-?) who married Orisa PERRIGO and Kate (1844-?) who married Abe RITTMAN (1836-?) and had children George and Irene. His brother John (1819-1894) married Catherine Remensporger and had a son, (John) George (1844-1935) but Catherine died soon after. In 1846, brothers John and Jacob Spittler sailed to America with their families and onboard ship, Jacob's wife Mary gave birth to a son, Charles. Upon arriving in America, the two families settled near Water Valley, NY but later moved to Hamburg (about 15 miles south of Buffalo) where Jacob became a shoemaker. Jacob and Mary had 4 more children - William (1847-1887) who married Carrie REPPERT, Frederick (1849-? ), Tilda (1852-1890) who married Henry RUSH and Albert (1856-1925) who married Ada BYRON. George and Frederick both moved to California and started drug stores near Santa Cruz, Albert became a butcher and William operated a hotel in North Evans, NY. George and children Charles Frederick (1875-1951) and Ida Flora are buried in Colusa, CA. Olive Spittler (1874-1944), daughter of William and Carrie Reppert Spittler is buried in San Bernadino, CA. John Spittler (Jacob's brother) married Elizabeth MOHR (1829-1912) from Buffalo and traveled west for a time, but returned to Rock Spring, NY where he purchased a farm and spent the rest of his life. John and Elizabeth had 10 children - Peter, Mary, Jacob, August, Louis, Anna, Lana, Kathryn, Carrie and Frederick (see Spittler Family Tree for more info). John George II (the first son of John I) married Catherine SCHNIERLE (1846-1935) and had the following children: Catherine (1871-1960) who married George HILL and lived in Allentown, NY, Benjamin (1874-1967) who moved to Idaho, John George III (1877-1921) who married Florence STONE and Dorothea (1882-1954) who married Fred STONE. Anna Mary (sister of Jacob, Jr.) who married Michael CARPP and moved to Van Buren Co., Michigan had children - Sophia, Mary, Charles, Albert, George, Edward, Millie, Vietta and Viola. Catherine (sister of Jacob, Jr.) married Martin KNOLL and had children Catherine, Caroline, Mary Jacob, William, Martin, Sophia, August, Albert, George and Matilda. August, Albert and Martin moved to Van Buren Co., Michigan. Salome (sister of Jacob, Jr.) married Andreas RISSER, moved to Fountain City, Wisconsin and had children Andrew, Frederick, Salome, Charles, Henry, Mary, Elizabeth, John and Emma. Jacob Jr's son Charles (1846-1901) also became a shoemaker and married Elizabeth PECK (1850-1932) from Angola, NY. The couple settled in North Evans, NY (on the south side of 18 Mile Creek, about 5 miles south of Hamburg-see below) and had 7 children - Ida (1870-?) who married Willard DUZEN and had children Erma, Ida and Norm; Flora (1874-?) who married Clifford CASWELL and had children Gordon and Charles; Herbert (1877-1954) who married Lottie COWELL and later Edith HERDLE and had son Herbert; Albert, Chester (1886-1970) who married Margaret FARRELL and had daughter Rita; Everett (1890-1970) who married Cora AKROID and had children Marion and Marjorie; and George, the latter born on George Washington's birthday in 1883. Johannes (1790-1858) & Eva Catarina LANG (1793-1859) METZ (MEZ) (the latter, a daughter of an American Indian girl who had been taken to Germany) of Blankenloch, Baden-Wurttemberg, Germany brought their family to America in 1835 when their son Jacob was just 3 years old and settled in a crude log cabin in Eden, NY. When that burned down, John built a house on Shadagee Rd. which has been occupied by several Metz descendants. The following children were born in Germany: Christine (1811-?) who married Michel Ernst, Catharine (1813-1872) who married William Glasser, Jacobine Josephine (1815-1875), who married Ernest Lang and moved to Davis, IL, Carl Frederick (1821-1865) who married Caroline Laupe, Margaret (1820-?) who married Jacob Heiler, Godfrey (1824-1885) who married Margaret Phary, Christopher (1825-1849), John (1829-1900) who married Barbary Eckart, Harriett Eighmy and Gertrude Braymiller and Jacob (1832-1925) who married Carolyn Erb. Elizabeth (1836-1905) who married Charles Pfattheigher and Henry (1838-1910) who married Mary Glasser (daughter of William and Catherine Metz Glasser) were born in Eden. 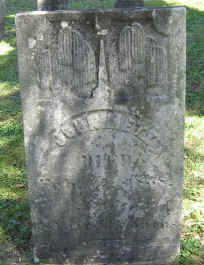 View Johannes Metz' tombstone in Evergreen Cemetery, Eden, NY. In 1855 when Jacob Metz was 23 he married Caroline ERB (1839-1919) of Buffalo, then only 16. Caroline's father had died and her mother Elizabeth remarried a man named John Wyble. Jacob and Caroline lived on the Metz Farm on Shadagee Rd. and had 9 children - Elizabeth (1855-1946) who married Fred Weimer, Julia+ (1857-1929) who married Herman Smith, Mary (1860-1937) who married Louis Foley, Emma (1869-?) who married Fred Schieber, Alfred+ (1870-1955) who married Bertha Schrum, Edwin+ (1875-1971) who married Caroline Wander (daughter of Caroline's sister Mary Erb Wander), Kate+ (1877-?) who married Carl Johnson, Lydia+ (1879-1953) who married Jacob Stadler and Edith - the youngest - born in 1882. ( + indicates family member with no living descendants). View Jacob and Caroline Erb Metz's tombstone in Eden, NY. Godfrey Metz started a cooperage near his parents' home at the age of 16. In 1846 he moved the shop to a place near the 4 corners of Eden. He employed many coopers and in 1858 installed the first steam engine. Godfrey also built the 1st hotel in Eden in 1848 in front of the cooperage which became a famous Eden landmark. He sold it to his brother John who in turn sold it to William Paxon who sold it to Pemberton in 1864 who sold it to George Roeller in 1876. It has been restored and was once called the Coach Stop Inn. Godfrey also built a house of entertainment called "The Birch Woods" where there were swings for children and a dancing platform for adults. He also built a racetrack where people would picnic. With his brother Chester, George Washington SPITTLER started a grocery store in North Evans, NY around 1900. The building which housed this store still stands today and is used as the town post office. Soon after, in 1904 George married Edith METZ and the couple moved to Lake View, NY (on the north side of 18-Mile Creek). George started his own slaughter house and meat market which he later expanded into a grocery store ("Spittler's Food Store"- created from a boarding house moved from Idlewood) where he worked (later with his son Charles) until he died in 1958 - over 50 years in business. He had the opportunity of a professional baseball career but his mother would not approve - he pitched for many of the local teams and remained an avid baseball fan his entire life. View photo of Hamburg Star Baseball Club which became champions of WNY baseball in 1901. George Spittler is on the ground in front on the right. George also helped form the Lake View Volunteer Fire Dept. in 1924, and served as its Chief for 23 years. Edith and George Spittler had 5 children - Kenneth (1904-1987), Carolyn (1906-1953), Naomi (1910-1994), Charles (1909-1999 ) and Donald (1919-2010 ). Edith died in 1966. George, Edith and daughter Carolyn are buried in Evergreen Cemetery in Eden, NY.